I am an Ofsted registered fun intelligent childminder with 16 years progressive experience caring for children of all ages, from new-born’s upwards. Mummy to a small born Feb 2018 :-) We are an LGBT family. Devoted, reliable, supplying loving care while making sure disciplinary and educational needs are met. I love my job and offer children clear guidelines; promoting positive behaviour, while learning and having fun. Experience with food allergies (ie. CMPA). My aim is to provide a childminding service that will allow your child to learn and develop in a safe, secure, home-based environment. Play will be at the centre of learning and development, with a wide range of activities and experiences appropriate to the age and stage of your child. I am Ofsted registered (EY543383) with insurance, to care for up to 6 children from birth to 8 years of age - offering home schooling as an option. I also offer out of school care for children over the age of 8. My childminding service is offered to all children and families; I may also be able to care for children with additional needs. Children will be provided with healthy meals, healthy snacks during the day, taking into account special requirements, allergies, etc. Children will be taken to the local parks, shops and library on a regular basis, as well as play groups, play gyms and playdates on occasions. I can offer a walking school pick up from a local school. A range of activities will be provided including arts and crafts, storytelling, construction toys, singing and musical instruments, jigsaws, games, learning sheets and role play. My service will be available from 8:00am until 6:00pm; I will negotiate an individual contract for each child. We have 2 cats at home who are usually out and about during the day. They generally keep to themselves. One day a week school walking collection possible. Includes: Healthy Lunch, Tea & Snacks; plus Groups, Fun Learning Activities, Arts & Crafts. Tax-Free Childcare and childcare vouchers available. Payment weekly in advance. Below are the latest reviews for Funshine. Please note that reviews represent the subjective opinions of other Childcare.co.uk users and not of Childcare.co.uk. Parents must carry out their own checks and references on childcare providers to ensure that they are completely happy before enaging in the use of their services. Tamsin has been childminding for a couple of years now but prior to that she nannied for many years; including for us looking after our daughter. She never failed to impress us with her skills. She is a kind, caring and a trust worthy person, always putting others feelings above her own. Tamsin is energetic and passionate about everything she does. Our daughter lit up in the mornings when she arrived and hated it when she went home. We have never before (or since) known our daughter to warm to someone so quickly. Our daughter moved on to nursery school and was immediately top of all subjects due to Tamsin's teaching and fun development. Our daughter excelled in everything thanks to Tamsin. Tamsin changed career to childminding. 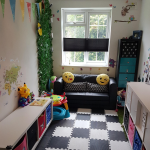 She offers a wonderful loving home with a fun lovely playroom. Tamsin has since had her own daughter who is a shining light and shows how Tamsin lovingly develops children, bringing the best out in them while giving them the room to grow and find themselves in this huge world. If you are looking for a childminder then look no further - cannot recommend highly enough. Jake to eat things I can't!! I wouldn't hesitate in recommending her to anyone, they would be lucky to have her as a childminder! I am a working Mum with twins and I met Tam initially as a nanny, looking after 2 sweet little 1 years old girls during the day. She also had their older siblings after school and in the holidays. I was extremely anxious about returning to work at the end of my maternity leave; and unfortunately Tam was unavailable as she already worked for a family. However, Tam was a great support and advised we had several visits to settle both boys and me into their new care. Our care has always been great and I fully trust my boys with our choice, but I do feel we missed out on that outstanding childcare not being able to employ Tam. She was very loyal to her family and job, which is a testament to her. Thankfully she was there as a support which made my transition of going back to work much easier. What I loved about Tam was how reassuring she was and that she kept her family fully updated as to how the girls were and what they were was doing through the day / week. As a parent going to work, you really miss out on all the little things and it was so nice to see Tam respected this; documenting the girls activities and sending photos showing how happy they were. And they were truly happy, all of the time with Tam. She is friendly, calm and assertive as well as very professional. The countless day trips and fun activities made the girls very happy. You could see their development due to being in Tam's care and I honestly think they are the little people due to Tam's helping hand in raising them. She is highly professional with ample experience, strong work ethic and integrity. I especially like her cordial and caring personality. Tam provides a safe and pleasant setting for children, where they do lots of educational and fun activities. She also takes children out to play groups, parks and farms etc. where possible. All the girls blossomed under Tam's care. Their language, communication, cognitive and social skills are well developed, thanks to Tam's minding and training. Tam also has a strong belief in learning, helping the little ones all day and focusing some good time to the older ones schooling in the afternoon. If we extend our family in the future, without question Tam is our childcare choice. I wish she had been available the first time as I can say wholeheartedly that the love and support, underpinned by structure and development, has been a testament to how well rounded those children have become. I wanted to tell everyone about how amazing you are and the pleasure of getting you know you while you were a nanny for close friends, but this ended up being about so much more – things that are much more important, things people should know, and showed me how deeply we miss you. We wanted to thank you for all the wonderful time, love and dedication that you show all children, not just the ones in your care but everyone's children really take to your warmth and loving, firm care. Mine really loved seeing you for playdates and babysitting, and always knew their boundaries. We know that we wouldn’t have been able to get through hosting any of the NCT playdates without you. It is with a great deal of sadness that we have to end our times (and playdates) with you due to our change in work location (change in country!) but we know you'll always be close in our hearts. Our friend knew that you would be the best person to love and take care of their children, and meeting you for the first time was an absolute pleasure. We knew from that moment, they had made the right choice, that you were the one for them (they must have interviewed at least 30 people before finding you!). Thank you for taking away all the stress and worry of a new mother (especially one with a whole host of questions!!) and offering help and guidance all in the right direction for our family. Not only did you become a friend there to support me and little family in your own time, but most importantly you were more than fantastic with the 2 you looked after. You taught them (and mine!) so much, giving so much time and dedicated yourself to the upbringing and enjoyment of their little life. They have all grown into capable children with a lot of love and care to offer, along with respect and manners! We, like our friends, couldn’t ever thank you enough for all that you have given – because it is invaluable. It was heart-breaking to move away, especially when number 3 was on the way. I was truly lost not having you to turn to. If work brings our return, you'll be our first pitstop and without a doubt our childcare choice. (Although I don't expect you to ever have any spaces!!). We hope we will be able to give just a fraction of the love and dedication to our children that you give to other peoples children! Tamsin looks after my two girls aged 4 and 6. She has built a irreplaceable relationship with them, they love spending time with her and have a lot of respect for her. Tamsin treats them as if they were her own and shares a special bond with each of them individually. Tamsin has done much more than merely supervise my children. She ensures that every day they undertake some form of learning, suitable for their ages, whilst making learning fun for them. She actively encourages them to want to learn more and read more. She also balances this with play and fun activities. I feel very secure in the knowledge that Tamsin is looking after my girls. She always remains clam, and deals with difficult situations head on. Tamsin is also very safety conscious and always ensures that safety of my girls comes first. In addition to the child care she provides, Tamsin prepares a healthy tea for my children each day. Among her strengths are her punctuality and efficiency. I simply cannot understand how she gets so many things done in such a short time. She is also very thoughtful, remembers important dates in the lives of our children and bringing them cards, gifts, and notes of encouragement. I highly recommend Tamsin. I know that all children in her care would be loved for and they would love her as much as mine currently do.